Lunch meat comes in many forms, from freshly sliced turkey breast to highly processed bologna. The former is a healthy source of lean protein, but the latter is a concoction of poultry and meat byproducts chock-full of sodium, saturated fat, and chemicals and low in nutritional value. Make healthy lunch choices by reading ingredient labels and choosing fresh cuts of meat over questionable "processed meat foods." Processed lunch meats are bad for your health. The healthiest lunch meat is fresh meat that's broiled, baked or grilled without skin, added fat or sodium. Buying fresh meat at the market and cooking it yourself at home to put in your lunch sandwiches is the healthiest option. Chicken breast and turkey breast, for example, provide nearly 20 grams of protein and an average of 140 calories per 3-ounce serving. That same amount has 6 or 7 grams of fat, the majority of which is monounsaturated fat. As an animal protein, poultry does contain saturated fat, but at only about 2 grams per serving, it's a minimal amount. Both meats are low in naturally occurring sodium, with about 50 milligrams per serving. If you can't prepare your own meat at home, you may have a few healthy options in the deli section of your grocery store. It largely depends on what type of market you shop in; the natural and whole food markets offer more choices. One brand of organic oven roasted turkey breast includes mostly turkey and a little water, salt and carrageenan — a stabilizer derived from seaweed. Other varieties of sliced meats labeled "natural" and organic may also be good choices; just be sure to read the ingredients list and choose products with few ingredients, none of which are hard to pronounce. Some unhealthy choices may be obvious — canned Spam, for example, is not a good choice. Spam Classic pork with ham has 24 grams of fat per 3-ounce serving, 9 grams of which are saturated. One serving also contains 1,185 milligrams of sodium. That's half of the amount of sodium that younger healthy adults should consume in a day, and it's 80 percent of the amount older adults and people with high blood pressure and heart disease risk should consume daily. Some other meats fare no better. Hard salami provides 29 grams of fat, 12 grams of saturated fat and 1,381 milligrams of sodium in 3 ounces. A brand of "luncheon meat" made with pork and ham delivers 25 grams of fat, 9 grams of saturated fat and 1,229 milligrams of sodium per serving. Fat and sodium in excess increase your risk of a host of health problems, including obesity, high blood pressure, Type 2 diabetes, metabolic syndrome, heart attack, heart disease and cancer. Read more: Is It Healthy to Eat Ham? 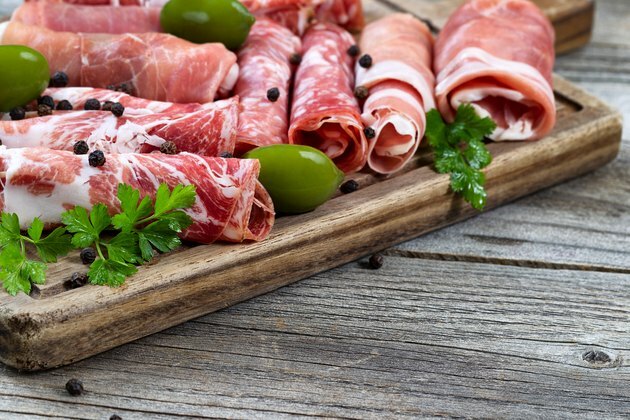 Processed meats often contain preservatives — nitrites or nitrates — that can have deleterious effects on health when consumed regularly. According to the Environmental Working Group, these preservatives convert to a substance called nitrosamine in the body that can be a potential carcinogen. In 2015, the World Health Organization's International Agency for Research on Cancer confirmed this when it announced that processed meat is carcinogenic to humans. This includes meats that have been smoked, salted, cured, fermented or otherwise treated to improve flavor and extend shelf life. The report revealed that consuming 50 grams of processed meat daily increases the risk of colorectal cancer by 18 percent.